The potential of CBD continues to impress. Not only in its therapeutic value, but in its ability to provide fantastic taste and flavour without a high. By harnessing the attributes that make CBD so desirable, RQS has masterfully blended all the benefits into an autoflowering seed. With up to 21% CBD, Solomatic CBD is the pinnacle of medicinal autoflowering strains. 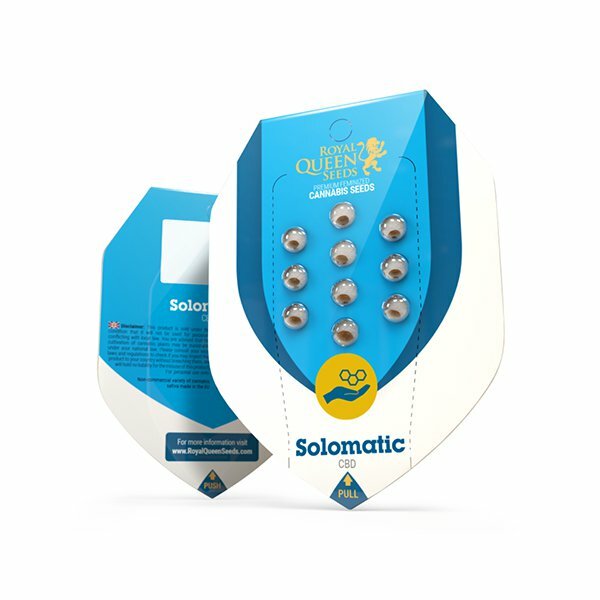 Solomatic CBD represents the first seed in RQS' extensive catalogue to feature an impressive CBD:THC ratio of around 22:1. Typical strains focus exclusively on the psychoactive properties provided by THC. With Solomatic CBD, you can savour the same delicate aroma and alluring taste cannabis connoisseurs love, without hampering your physical or mental performance. To deliver the ultimate incentive, all of her therapeutic benefits can be enjoyed after a grow cycle that doesn't require you to alter light cycles. Her autoflowering genetics allow even the most inexperienced growers to reap the rewards of top-quality cannabidiol. Reaching medium heights, Solomatic CBD is the perfect candidate indoors or out, regardless of the limitations of your environment. Anyone who is cautious of an autoflowering seed needn’t be; her superior quality shines through at every stage of development. Thanks to her genetic diversity—the result of crossing Diesel CBD Auto and Asia CBD Auto—she provides a seductive aroma. The initial burst of sweet, fruity flavour is followed by hints of ginger and undertones of pine. With a harvest time of 9–10 weeks after sprouting, experiencing the therapeutic prowess of CBD has never been easier.